↑ Ottfried Neubecker, Heraldry - Sources, Symbols and Meaning, pp.106, Tiger Books International (Twickenham), 1997. ↑ "Greek Independence Day". www.britannica.com. สืบค้นเมื่อ 2009-09-09. 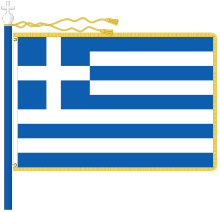 The Greek revolt was precipitated on March 25, 1821, when Bishop Germanos of Patras raised the flag of revolution over the Monastery of Agia Lavra in the Peloponnese. The cry “Freedom or Death” became the motto of the revolution. The Greeks experienced early successes on the battlefield, including the capture of Athens in June 1822, but infighting ensued. ↑ Frazee, Charles A. (1969). The Orthodox Church and independent Greece, 1821-1852. CUP Archive. pp. 18–20. ISBN 0521072476. On 25 March, Germanos gave the revolution its great symbol when he raised a banner with the cross on it at the monastery of Ayia Lavra. ↑ Law 851/21-12-1978 On the national Flag, War Flags and the Distinguishing Flag of the President of the Republic, Gazette issue A-233/1978. ↑ 14.0 14.1 Album des pavillons nationaux et des marques distinctives. Brest, France: S.H.O.M. ; 2000. p. 238. ↑ Flag Manual. Beijing, China: Beijing Organizing Committee for the Games of the XXIX Olympiad – Protocol Division; 2008. p. B15. ↑ Flags and Anthems Manual. London, United Kingdom: London Organising Committee of the Olympic Games and Paralympic Games Limited; 2012. p. 47. ↑ Presidential Decree 348 /17-4-1980, On the war flags of the Armed Forces and the Gendarmerie Corps, Gazette issue A-98/1980. หน้านี้แก้ไขล่าสุดเมื่อวันที่ 30 พฤษภาคม 2561 เวลา 17:30 น.